Infographic of the Day: Just How Big Is the Deficit? 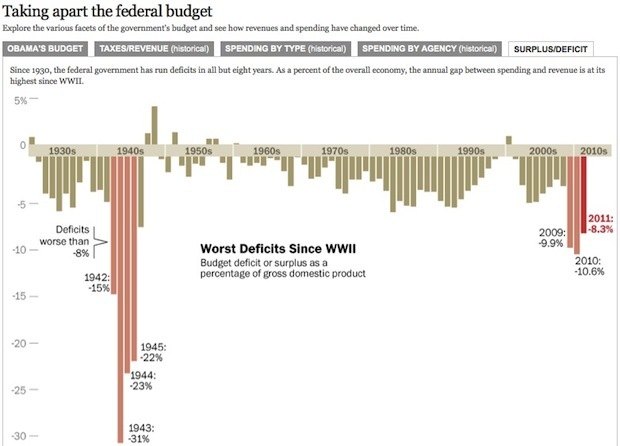 Yesterday we brought you a round-up of visualizations of President Obama’s 2011 budget. Today, a straggler, courtesy of the Washington Post. What leaps out is that the current budget shortfalls were dwarfed by those seen in World War II–but they’re also quite large compared to any from the last thirty years. But the World War II comparison is instructive, because what likely pulled us out of those budget deficits was the booming, post-War American economy, which in turn was fueled largely by manufacturing. Likewise, unless we’re prepared to raise taxes and cut Medicare and Social Security–which no politician these days could ever pull off–we’ve got to hope for a new growth engine. Green energy, anyone? Meanwhile, another interesting factoid that springs from this graph is the scarcity of a balanced budget in history. It’s only happened in eight of the last 80 years. Virtually every politician talks about it. Only Clinton seems to have done it–and here, his administration was massively aided by the dotcom bubble, which artificially raised tax revenues for a brief period.